Go ahead and hit that snooze button, ’cause if you’ve taken a few minutes to prepare these Vanilla Peach Overnight Oats, breakfast will already be made, which gives you at least five extra minutes to linger in dreamland. 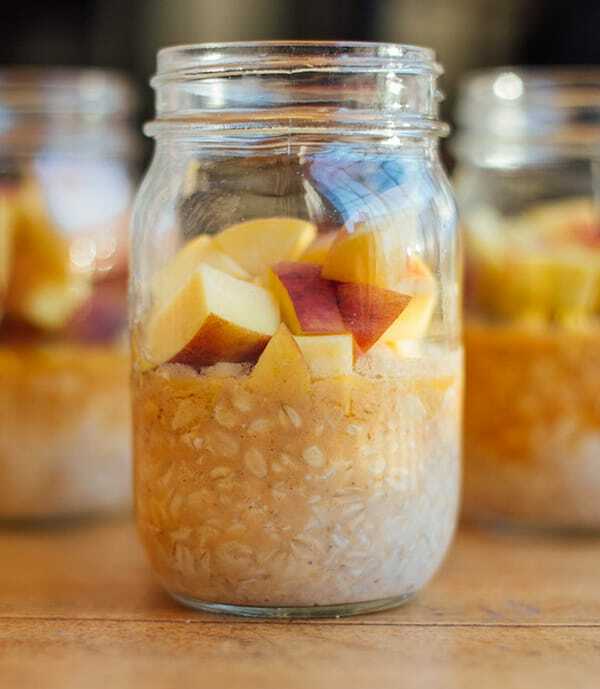 For this sweet and simple Vanilla Peach Overnight Oats recipe, simply fill a pint-sized Mason jar (or small bowl) with old-fashioned rolled oats, Vanilla Shakeology, water, a touch of vanilla extract for even more vanilla flavor, and slices of fresh (or frozen) peach. Seal the jar and place it in the fridge overnight. In the morning, the oats will be soft and ready to eat. We like our overnight oats straight out of the fridge, but they can also be heated in a microwave. We use old-fashioned rolled oats in this recipe because they keep their shape nicely and get soft but not mushy. They also give this breakfast a hefty serving of fiber, which keeps your digestive tract in business and helps you feel fuller longer. Want to make your morning a little more decadent-tasting? Add a couple of teaspoons of peanut or almond butter! Grab a jar and a spoon and start your day with a hearty breakfast that tastes so good you’ll forget how nutritious it is. With 23 grams of protein, these overnight oats are also smart snack before or after a workout. Make your mornings easier, and more delicious, with this overnight oats recipe featuring Vanilla Shakeology and fresh peaches. No cooking required! This delicious breakfast can also be made in a one-pint Mason jar.